Writing about the Sanspareil Rock Garden in a letter to her brother, Frederick the Great, Margravine Wilhelmine declared that "Nature herself was the architect". And it was true that the garden begun in 1744 was dominated by the bizarre natural rock formations in the beech grove of Sanspareil. 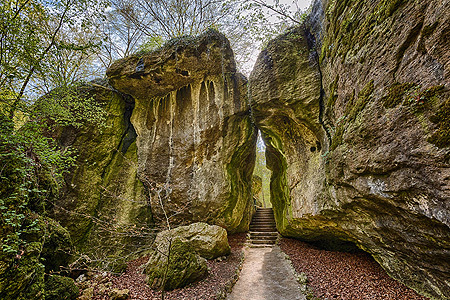 In the time of the margraves, individual rocks and caves were named after the locations of events in the French novel "Les Aventures de Télémaque". Small buildings, some made only of wood, were added to the magnificent natural setting. Many of these buildings fell into ruin in the course of time or were sold in the 19th century for people to take away. The rock theatre in the grove, the Oriental Building and the kitchen building have remained. The sunken parterre between the Oriental Building and the kitchen building was recreated in 1984 from an engraving dating from 1748. Near Sanspareil Rock Garden the medieval Zwernitz Castle can be visited.